1997: 94-94-77	= 265 (10th). 1998: 98-93-86 = 277 points (14th). 1997: 100-92-13 = 205 points (21st). 1996: 100-96-90 = 286 (5th). Mike von der Mooreiche competed multiple times in the D.V. Meisterschaft (placed fifth in 1996 with 286 points) and placed tenth at the working I.D.C. World Championship in 1997. His brother from a repeat breeding, Larry von der Mooreiche, was the winner of the working I.D.C. World Championship in 1997 and became D.V. Leistungssieger in 1995 and 1996. 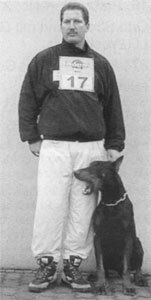 Their sire, Ikarus von der Kollau, passed the Körung 'for life' with highest possible rating for hardness and working drives while their dam, Cora von der Mooreiche, and her littermates, Castor and Chiela, competed in the D.V. Meisterschaft and also passed the Körung 'for life' with ratings ranging from high to very high. Bandit: SchH 3, FH and IDC-Weltmeister in 2004.